There are many, many games that won’t make this list, including all games that I’ve designed (Viticulture, Euphoria, Scythe, and Charterstone), published (Between Two Cities and My Little Scythe), or experienced as a one-time campaign (Risk Legacy, Near and Far, Pandemic Legacy, etc). That’s it! For more details, please see the video below. Are any of these games on your current top 10 list? What are some games on your list that you think I should try? This entry was posted on Sunday, August 26th, 2018 at 9:40 pm	and is filed under favorites and tagged with board game, favorites. You can follow any responses to this entry through the RSS 2.0 feed. Just curious… you don’t put Time Stories in the same bucket as the other legacy/campaign games? Do you treat it more like, say, an LCG? The only one on your list that I’ve played and own is Fantasy Realms. I clearly have to try/play more games! I treat it separately because new content keeps coming out for TIME Stories. I love my legacy games, but when I finish their campaigns, I don’t return to them again. Except Charterstone?! 🙂 But that is ineligible for this list, as you mentioned. Sorry, I’m just halfway through your video for this, as it’s still in my work day (here in Australia), so you might have already answered my question there. This is a comment about your comments in the video re T.I.M.E. Stories (TS). It is also my favorite game, especially because it’s the only game I found to use as a starting point model for a game I’m designing. So I love that you love features such as: having players participate in the story narrations (“like in a movie”); stories told by a combination of images and text; and the requirement that players tell other players the card content in their own words rather than reading it aloud verbatim. It’s encouraging that you like the very features I’m trying to boost. And the helpful podcast link you provided elaborates on TS features even more. 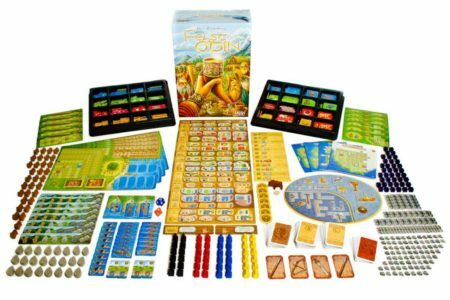 Features you highlighted in other favorites are also relevant to my efforts—namely, in #2 Feast of Odin, filling in the shapes and seeing them appear on the game board; and in #9. Yedo, that players are involved in missions. I’m glad you’ve enjoyed TIME Stories as well, Dorothy!